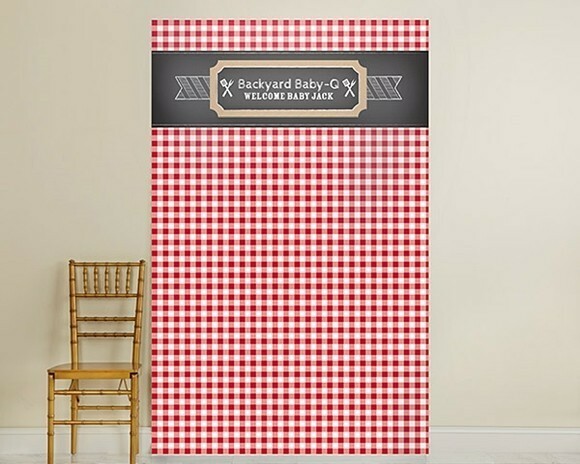 With its red and white gingham print and grilling utensil graphics, this barbecue-inspired photo backdrop will allow you to capture wonderful memories at your barbecue party or baby shower picnic. Simply customize this backdrop with a special message or event details, grab some props and let the good times roll! The phras e"Backyard Baby-Q" is NOT automatically-included. Available only in the colors and fonts shown. PLEASE NOTE: Mounting supplies are not included with the backdrop. Each backdrop ships in a mailing tube and is made of tear-resistant 7mil polypropylene that is water-resistant with a scratch-resistant coating.